November 8th, the “ anniversary ” of demonetization, was also a day that hazardous airborne pollutants crossed critical levels in Delhi. One event caused enormous economic damage because of needless government intervention in economic activity, and the other caused great environmental damage because of government apathy and indifference. What a poignant reminder of the dangers of big government! Big government is the source of many of India’s problems. Poverty, corruption, black money, fraud and abuse, environmental neglect, red tape, are all the result of a large and intrusive government that attempts to do too much, but ends up doing nothing well. The state’s significant control over economic and social activity creates a dependency in which citizens are compelled to rely on the government to solve most problems. Unfortunately, as demonetization and Delhi’s pollution woes show, the government is often not the solution to many of our problems; on the contrary, it is the problem. Take corruption for example. The vast majority of corruption occurs in transactions in which someone from the government is involved–police, politicians, bureaucrats, public works officials, etc. There is little need for bribes in private transactions because they are conducted on a voluntary basis with no coercion. No bribes are required, for example, when transacting at the local grocery store or shopping online. But government transactions involve asymmetric control and authority which create opportunities for government officials to extract bribes. A recent survey by corruption watchdog Transparency International found that 93% of the bribes paid by people were to local, state and central government employees and only 2% to the private sector. 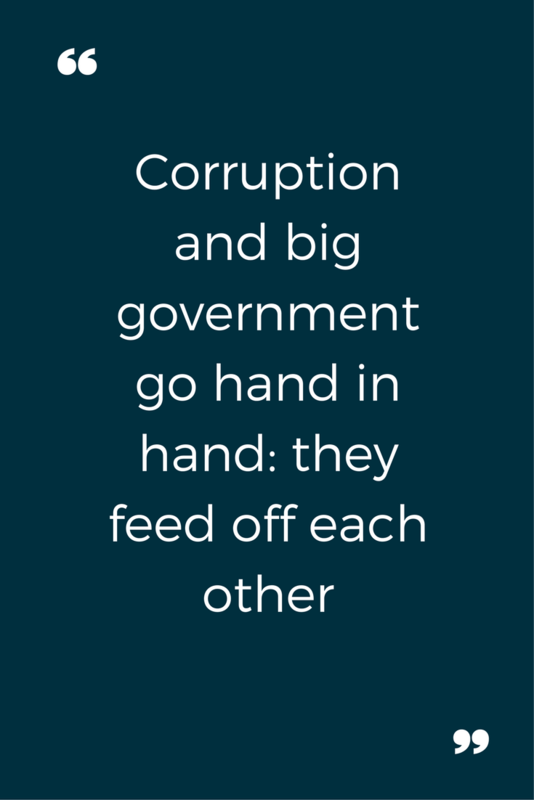 Corruption and big government go hand in hand; they feed off each other. The government is also responsible for the majority of abuse, fraud, and waste in the country. A private company would never waste its own money, but those in government don’t deal with their own money so have no compunction about squandering it. In 2016, the Delhi government reportedly spent over Rs. 400 crores of taxpayer money to promote itself and its accomplishments. The Central government too spent more than Rs 1,100 crore in two and a half years (from June 1, 2014, to August 31, 2016) on advertisements, according to information from the Union Information and Broadcasting Ministry. Would they spend this money if it were their own? What about abuse of power? I recently witnessed the Chief Minister of a State travel with an entourage of 30 cars including heavily-armed security personnel, signal jamming vehicles, police vans, a fire-brigade, and an ambulance. Is all this necessary and who pays for it? A few months back, a Member of Parliament physically assaulted an airline employee. In most other countries he would have been immediately arrested irrespective of his position, but in India, the police did not even register an FIR against him. It is rare to see politicians or members of the government arrested for abuse of power or corruption. Corrupt officials and politicians are untouchable when in power, and when out of power they have an ‘arrangement’ with the government to turn a blind eye. The Modi government repeatedly accuses the Congress of massive and blatant corruption, yet even after three and a half years in power, it has failed to charge or convict anyone of fraud. Which institution provides the worst service to its customers? Most Indians have come to expect wretched service from government agencies. Government employees believe they work for the ‘government’ and not for the people whose taxes pay their salaries. As a result, government officials behave like medieval lords indifferent to the needs of the citizenry. And since the government has a monopoly on the provision of most public services, citizens do not have the choice to decline these services or shop elsewhere. In industries where people do have a choice between the government and the private sector–airlines, telecommunication, for example–they overwhelmingly choose the services provided by the private sector. The government is also the most extractive institution in the country. Almost 80% of the politicians are crorepatis in a country where less than 0.003% of the population are crorepatis. And these statistics are based on ‘declared’ assets and not actual assets, so in reality, it is likely that more than 99% of the politicians are multimillionaires in a country where 90% of the people make less than Rs. 10,000 per month. This discrepancy is damning evidence of the insidious cancer of big government. No other institution extracts more from the Indian people than the government. India’s government is big, powerful and intrusive. There are 51 Ministries at the Center and an average of 43 Ministries in each State. This the highest number of any country in the world. The UK-based Legatum Institute publishes an index which ranks countries by governance. India with its 51 Ministries is ranked 47th on that Index. The top 25 countries have on average only 16 ministries. Nations with smaller governments receive higher rankings on attributes such as economic prosperity, citizen welfare and satisfaction, global competitiveness, safety, economic and political freedom and so on. The evidence is irrefutable. There is a strong inverse relationship between the size of the government, and quality of governance and the nation’s prosperity. The bigger the government, the worse the governance and lower the level of prosperity in the country. India’s transformation as a prosperous democracy will start only when this broken institution is fixed and its size, reach, and intrusiveness reduced. To proceed on the path to a better government the debate has to be rekindled on two points: what should the government do and what level of government should do it. The Indian people’s dependence on the government to do things is boundless. They expect it to remove corruption while they themselves engage in bribery. They expect it to remove illiteracy but rarely volunteer to teach those around them. They expect it to help the poor but show little compassion themselves for those in need. They expect the government to make India clean but throw litter around indiscriminately. For the government to shrink, the people will be required to take on greater responsibility. You cannot hire a teacher to teach your child and then walk off and blame the teacher–you have to be willing to take greater responsibility at home. If the people of this country are willing to self-govern with integrity, power can be devolved away from the big governments in Delhi and the State capitals to the local level. Every city can elect its own Mayor, every urban local body its own councillors and every village its own Panchayat. Democracy is more than majority rule–it is premised on the notion of self-governance. Mahatma Gandhi’s ideas of Swaraj and Sarvodaya were no different. He envisaged a self-reliant society of highly evolved citizens who were not dependent on the government. But India is caught in a vicious circle. All of India’s government’s since independence have been big governments–paternalistic, and socialist nanny states–who have operated under the unstated premise that people are weak, stupid, helpless, incompetent, dishonest and dangerous to themselves and others. A government of ‘competent’ people is thus required to manage the economy, regulate morality and personal behaviour, and tell people what to do and how to do it. This dependence reduces people’s ability to be self-reliant and responsible, which then justifies the need for a big government to ensure social order. The people of India have to make a choice–If they want to reduce the size of the government and take greater control of their communities they will have to accept greater responsibility, show better civic sense and awareness of social ethics, higher levels of integrity, greater compassion for those less fortunate, deeper appreciation and respect for the rights of others, and an abiding respect for the rule of law. Otherwise, they will have to put up with the excesses of big government, the corruption of the political elite and their cronies, the abuse of power, tax terrorism, the recklessness of policy decisions like demonetization and the apathy and indifference that will eventually pollute and kill our environment. The choice for the Indian people cannot be more clear: self-responsibility and accountability, or the excesses of big government.